As the days lighten and spring approaches, many people begin their annual battle for that perfect summer beach body. But as any trainer or doctor will tell you, the best summer bodies are made in winter. Cosmetic procedures are no different, and due to the time needed to recuperate afterward because of pain and swelling it is worth thinking about how you should plan your procedure. Not only does planning ahead allow you to arrange surgery around the big events in your life, you can use as environmental factors and the seasons to your advantage as you rest and recuperate. 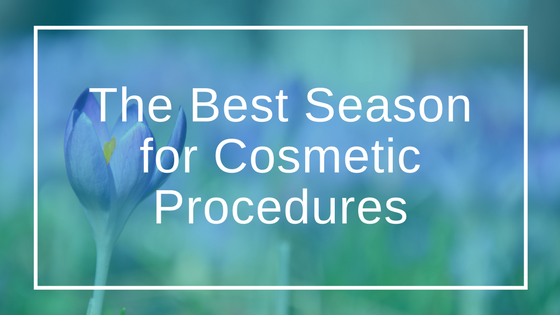 Dr Gupta looks at how to plan your surgery around the seasons. Warmer weather puts summer firmly in the minds, and the weddings, beach holidays and summer dresses that come along with it. The longer days make it easier to venture outside and increase your exercise times, along with proper dieting. You want to look your best for summer bathing suits, and so scheduling minor surgery, liposuction, breast augmentation and body contouring for this time period is sensible. Using spring as an inspirational guide, you can even alter your makeup and hair to deflect any attention from minor facial procedures or breast reduction. Following a procedure such as a breast reduction you must slow physical activity for several weeks, so take advantage of the fact weather usually remains cooler to cover swelling and bruises under your clothes. It is not unusual to hear of clients opting for spring surgeries as part of their New Year’s resolutions, and having a couple of months healthy eating and exercise will put them in a great place to have the procedure done. The time of year when most people want their appearance to be at its absolute peak, summer is when we want to show off more skin, wear fewer clothes, and enjoy our holidays. Imagine the frustration of being stuck inside when you’d like to be out and about. The summer heat could also worsen swelling and bruising from an operation, slowing the recovery or even doing more damage. Fresh scars must be kept away from the sun’s UV rays, as they could turn permanently red or brown and refuse to fade the way most scars do. Liposuction or tummy tucks require you to wear a compression garment as part of the surgery; not a great look at the beach along, or indeed an enjoyable feeling in the heat. Body contouring and other such surgeries are perfect for autumn weather. As you will have dieted and exercised through the summer, your skin is relatively loose and easily altered through modern techniques such as microlipo. An autumn or later procedure means plenty of recovery time, enabling you to get used to your new look before showing it off the next summer. Cooler weather is also more helpful to the healing process, allowing you to be back to yourself in no time. Your wardrobe will also come into play, with clothes that keep you warm also covering post-op work. Many people take advantage of the holidays and cold weather by scheduling major surgeries for just after Christmas, with cosmetic procedures well-suited to the cold weather. Bundle up and cover any bruises or swelling with jackets and turtlenecks, and take some time to recuperate as you watch endless hours of Christmas movies. Most skin procedures require you to remain out of the sun, and with cold days and little sunlight, your body can easily hide until fully healed. Winter is the prime time for major surgeries, and it is important to minimize your exposure to regional colds and cases of flu. It is best to reschedule the surgery if you come down with a virus, contract a virus, and you must allow yourself to recover according to doctor’s orders to have a successful procedure. It is possible to compromise your health and appearance if you do too much too soon and expose yourself to the sun after a procedure. Treat your body kindly to reap the rewards. Dr Gupta is committed to the health of his patients can answer any questions you have and give advice about the best time of year for cosmetic surgery.